The Panacur PowerPac or Safe-Guard Power-Dose is a conveniently bundled package of five syringes, each containing a double dose of fenbendazole paste dewormer for an average size horse. Using Safe-Guard cattle dewormer to administer the fenbendazole purge deworming is roughly half the cost per horse compared to the Panacur PowerPac and Safe-Guard Power-Dose products. A 1000ml bottle of Safe-Guard cattle dewormer contains enough liquid fenbendazole dewormer to administer the 5-day double-dose fenbendazole purge deworming to four 1000-lb horses, with a cost per horse of about $27 (depending on shipping costs). 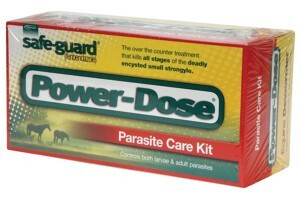 The Panacur PowerPac or Safe-Guard Power-Dose paste fenbendazole dewormers packaged for horses cost about $50-$60 per horse (prices vary) to administer the fenbendazole purge deworming. If you plan to deworm several horses, the gallon and 1000-ml bottles of Safe-Guard cattle dewormer are more economical. If you plan to deworm one horse, two or three 125-ml bottles of Safe-Guard cattle dewormer might be more convenient. Buy two or three 125ml size Safe-Guard (labeled for use with goats) to purge deworm one horse. The 60ml syringe and Safe-Guard cattle dewormer are available from most livestock supply companies. What’s the dosage for an equine? The cattle dose rate (per pound of body weight) on the Safe-Guard cattle dewormer packaging is the correct dosage for single-dose deworming of horses as well. Double the cattle dosage to get the daily purge dosage for horses. The daily purge dosage for horses is administered once per day for five days in a row. Horses, ponies, mules, and donkeys are all dosed at the same rate per pound of body weight. Safe-Guard cattle dewormer contains 100mg fenbendazole per ml of liquid. How do I administer Safe-Guard cattle dewormer to a horse? Find the daily purge dosage for your horse’s body weight in the table above (or use half the daily purge dosage for a normal deworming). Use a 60ml syringe to measure out the correct dose of liquid dewormer for your horse’s body weight. For example, for a 1000 lb horse, administer 46 ml of Safe-Guard cattle dewormer each day for five days in a row for a purge dose. To administer a normal single dose, give 23 ml of Safe-Guard cattle dewormer once. Empty the syringe over your horse’s feed. Use an amount of feed that your horse will eat completely in a single meal so that the entire daily dose of dewormer is administered at the same time. Most horses don’t seem to object to the taste of Safe-Guard and will readily eat feed with the dewormer added, but you can also syringe the liquid dewormer directly into your horse’s mouth. 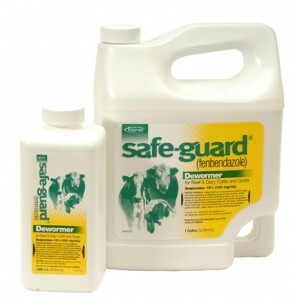 Safe-Guard cattle dewormer is also called Safe-Guard 10% suspension or drench. Safe-Guard cattle dewormer is a 10% fenbendazole suspension, available in a 125-ml bottle labeled for use in goats, and 1000-ml and one-gallon bottles labeled for use in cattle and goats. Intervet 10% fenbendazole liquid dewormer sold in the UK is labeled for use with horses and other equines, including donkeys and mules. Safe-Guard cattle dewormer may also be used to treat internal parasites in dogs. Consult your veterinarian or the Safe-Guard Canine label information for dosing information. Safe-Guard cattle dewormer does not have a strong taste or odor. Most horses and dogs will readily eat Safe-Guard mixed with food.